The first step is to prepare the sweet apples. Wash them and cut out the top of each one.Do not throw the top part.Save it. With a small spoon or something like that,scoop out the inside part of the apple.Remove the core and the seeds. Crush or chop the raw walnuts. Put them in a medium size mixing bowl or plate. Add the ground cinnamon powder and the raw honey or maple syrup. Melt the butter or extra virgin coconut oil in the microwave for about 30 seconds or on the stove for about 1 minute. Add the melted butter to the bowl with walnuts,honey and cinnamon.Set aside. Mix everything very well,until it is well combined. Put the stuffing from honey,walnuts,cinnamon and butter in the apples. Get a baking sheet or any other baking dish and place baking or parchment paper on it.If you do not have baking paper,spray a little bit of non-stick cooking spray or brush with some extra virgin olive oil or butter on the dish. 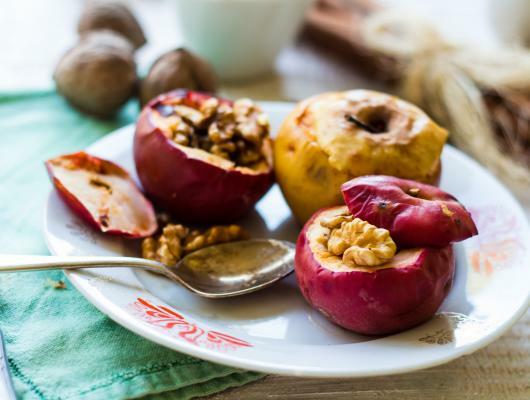 Place the stuffed apples on the baking dish and add a little bit of water in the dish. Put them in the oven and bake for about 25-30 minutes until they are fully cooked. After baking,remove from the oven and serve them immediately.They are better when are warm. And that is it.You just made one healthy and sweet,sugar free dessert for the whole lovely family or best friends. 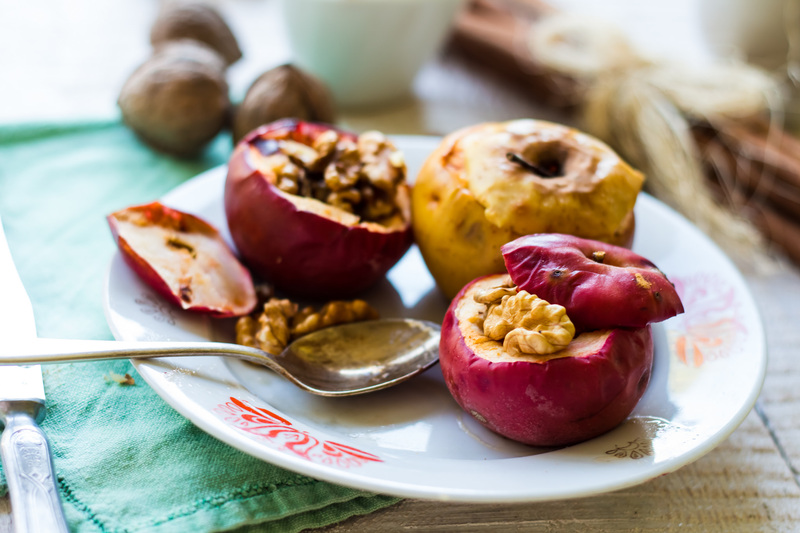 These baked apples are one of the easiest and healthiest desserts,which you can make for yourself.Or your lovely family or best friends.They taste absolutely amazing and really sweet.Really easy and fast to prepare and cook.With only 5 ingredients.When I was a kid,I really liked these apples when my Mom made them.And my family too.